Hi everyone! I have this little shelf queen that for no apparent reason became one at the beginning of the year. 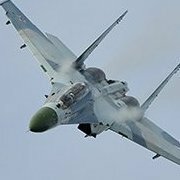 I wanted to build Su-30M2, but upon just closing the fuselage halves, seeing all the Trump's mistakes, I lost all the mojo. I am resurrecting her now for this GB. In the past few days, I've attached the intakes, the nose, started puttying, sanding and rescribing lost details. The work I hate the most. Oh and I've started working on cockpit. And this little man, which will look much better after he'll receive some flat coating. The figure comes from a Zvezda kit but is quite big for the Trumpeter's K-36 seat. So his legs had to be amputated and the bottom of the ejection seat removed, so the height of the pilot will be correct in the cockpit.